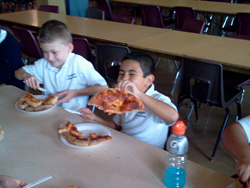 Mr. David Roman, the owner of David’s Big Size Pizza in Roselle, donated enough pizza dough so that all the Fourth Grade students could make their own pizza. 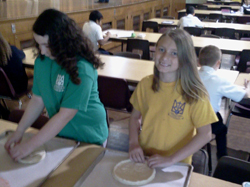 Ady Roman then demonstrated how to stretch the dough and dress the pizza. 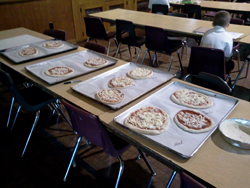 The pizzas were baked and given back to the student so they could cut them into eighths. The students then had to make an equivalent fraction before they were allowed to finally eat their pie. For some it was very hard not to take a bite out of the pizza first, but, they had been working with fractions for weeks now and they accomplished their task very quickly. The drooling ended almost before it began. What fun!